Photo courtesy of Robert Raack. Bob Raack stands and stares at an oil-covered canvas. Hours upon hours of work went into the constructed image that rests upon it. 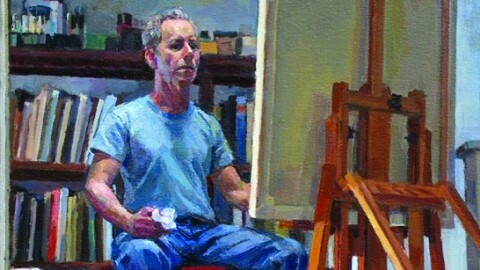 After examining his work for a moment’s time, Raack moves, walking past the easel and toward his subject. He saunters around the subject, considering every aspect of it. Raack returns to the easel and notices that the image is displaced. Rather than start anew, he spends the next four hours painting, redoing two-thirds of his work, moving the entire image two inches to the left. Bob Raack is an artist of life. He has taught at Youngstown State University for the past seven years and currently resides in Cleveland Heights. Raack studied at the Cooper School of Art for seven years and graduated as an illustration major. He worked as an illustrator, creating visuals for books, calendars and other specialty products but continued to paint on his own. Raack earned his Master of Fine Arts from Kent State University in 1981. Raack works mostly in oils and watercolors. Mediums are dependent on the time of the year. In the summer months, Raack produces paintings done in watercolors, working on site — in the winter, oils. At the age of 13, he made the decision to dedicate his life to art. Raack began to enroll in as many art-centric classes as possible at school, and at the age of 15, he took private lessons. “Some people said I have the gift, but I started early,” Raack said. “That kind of discipline is what it takes to do anything well. Aside from his work in the visual medium, Raack played drums all throughout high school in the rock n’ roll band The Changing Times. The Changing Times practiced every day and performed two to three times a week professionally, pulling in a couple hundred dollars every night, and even had a record deal. Raack credited his work in The Changing Times as a developing factor in his work ethic. Everything Raack paints is done on site or with a physical subject in his studio, never from photographs. Raack often seeks out his subjects in nature, be it a running river or an ascending hillside in a quarry. He stands his easel in the rushing current, weighing it down with rocks, or below the precipice, brushing the falling snow away. Raack paints things that he is personally interested in, oftentimes houses. He observes these homes — the landscape and proximity of the house. Raack, if necessary, will ask to see the inside of the home for a better understanding of its exterior and surroundings. Raack’s love of nature only grew in his time spent at the Interlochen Center for the Arts in Interlochen, Michigan. He spent those summer months among artists of other disciplines such as music and acting. There was no television or other forms of distraction. After half days of teaching, he wandered amidst the surrounding flora and fauna, painting sand dunes, rivers and lakes. Raack fed himself, sitting in a boat catching fish. He escaped city life and regular civilization and found art and nature. “I move with the experience as it presents itself to me,” Raack said. Although oils and watercolors seem flat and stationary upon a canvas, Raack explained the necessity of light, space and movement in his paintings. Light reveals space; every area is color, every area is illumination. Raack explained that his paintings exist on no edge and have no boundaries — everything that comes into being comes from movement, the greatest example being life through procreation. Raack noted similarities in the approach of observing nature between science and art. There are still more discoveries to be made in both disciplines. Both are observations — art being perceptual and science being physical. Both disciplines also bear formulas or techniques that can be applied by their practitioners. Raack acknowledged the vital presence of masters in art and the consideration of their work —that other should recognize what they have done and build upon it. “No one’s reinventing the wheel, but they may be driving the cart somewhere else,” Raack said.